April 10, 2019 • Christy Hovanetz, Ph.D.
Two decades of experience in Florida and A-F school grading adoption in 15 other states have positively impacted students with more educational opportunities—resulting in students who are better prepared for success in school, careers and life. 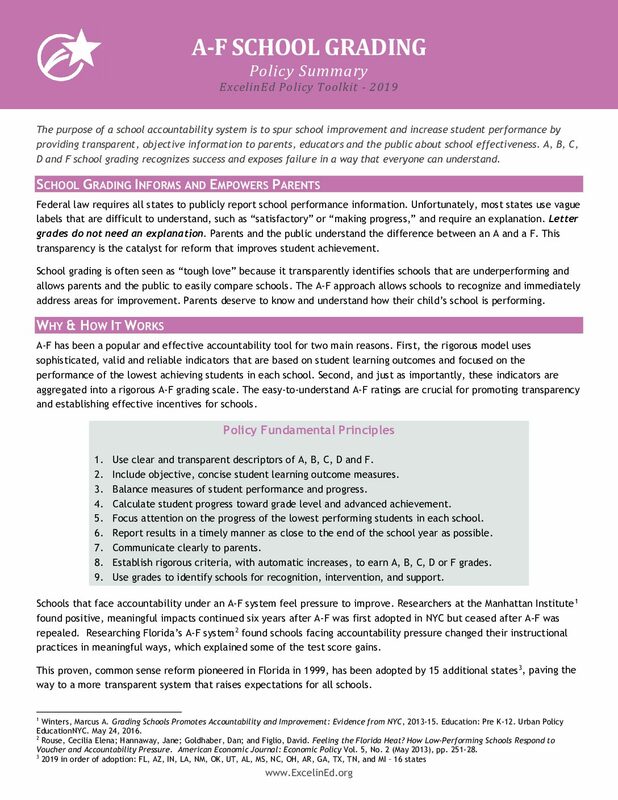 Read on for insights into four advantages of A-F school grading. 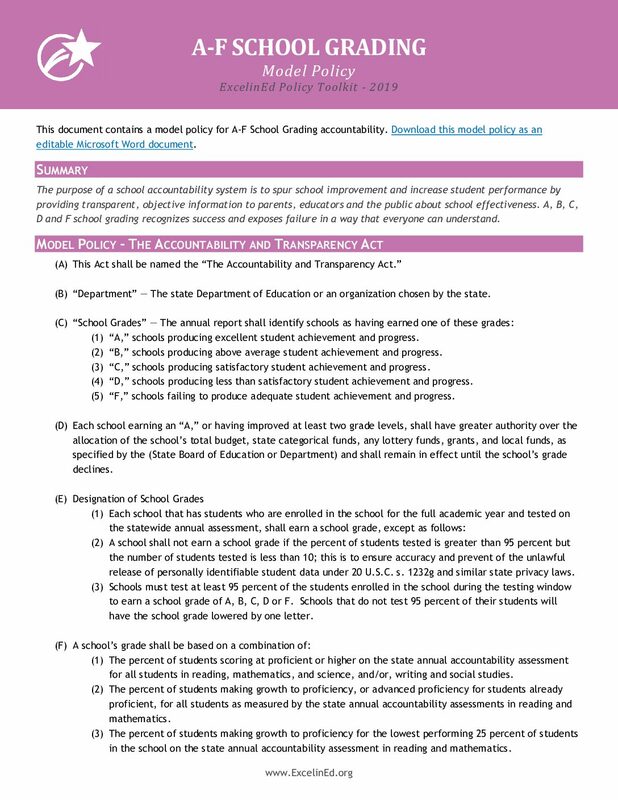 A-F school grading creates a system-wide focus on school effectiveness because administrators, educators and parents understand A-F grades. No one is satisfied with a C grade or even a B grade. In the 16 A-F states across the country, stakeholders strive for excellence in a way you don’t see with fuzzy descriptors like “satisfactory” or “performing.” Grading schools on a scale of A-F produces a sense of urgency to ensure our schools are meeting the needs of every student. Transparency in evaluating schools attracts more attention—from extensive media coverage of individual school effectiveness to realtors who highlight good school grades as a selling point on the housing market. This attention brings more investments in time and energy from families, teachers, administrators, policymakers and all community leaders to support and improve schools. Schools now have a real, tangible sign of their excellence and hard work. Despite any initial objections to school grades, it is not long before everyone begins displaying their grade on the school marquee, hanging banners or doing local press about the fact that they earned the coveted A grade or jumped from a D to a B. In an A-F system, low performing schools are easily identified and communities rally around them. A-F states can share numerous stories of communities coming together to improve schools to raise student achievement. For example, in one Florida district, an entire school board meeting was dedicated to how the district could become the first in the state with no C schools. That would not have happened if the old labels of “satisfactory,” “making progress,” and other vague language had still been in place. Easy-to-understand school grades are crucial for promoting transparency and helping parents choose the best school for their child. That’s why A-F school grades have been incredibly popular with parents. In a national poll, 84 percent of parents supported assigning schools a letter grade based on how well they educate their students (McLaughlin & Associates, 2014). 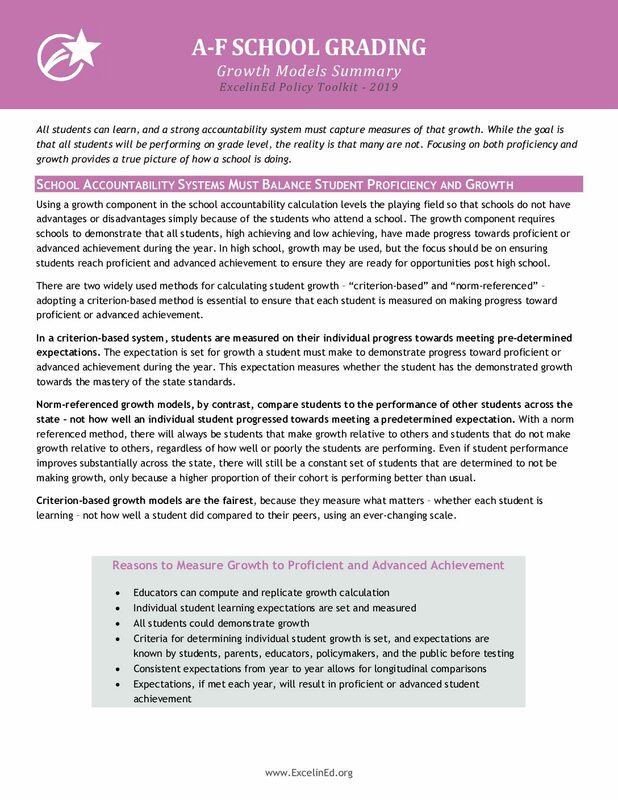 Head over to our School Accountability page or check out the resources below to learn more about how transparent, objective school accountability systems can increase student performance and spur school improvement.